I recently sat in on the San Antonio Board of REALTORS (SABOR) Military Housing Forecast for 2016. A housing office manager from Lackland presented as one of the first panelists speaking on how to market to military. Without going into too much detail, I will share that one of the first places she mentioned as the BEST place online to market was, of course, MilitaryByOwner. She shared that it’s one of the first places she refers military families to when they’re looking for off-base housing. When the military housing speaker asked the room of well over 1,000 agents whether they listed their properties on MilitaryByOwner, there was silence. Finally, about 20 people raised their hands. That was in a room of 1,000 agents in a military-strong market where MilitaryByOwner has a huge market presence. 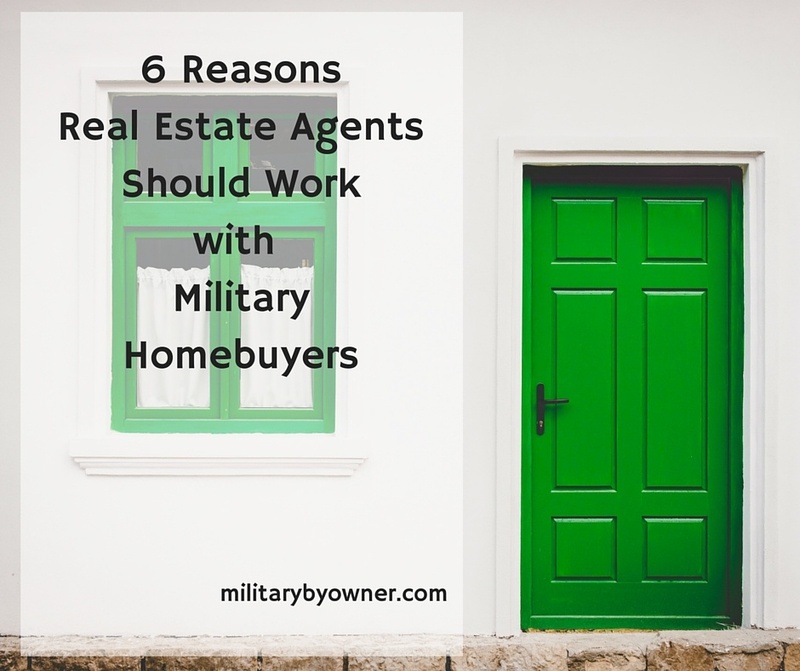 While those couple of dozen agents may not appreciate me sharing their lead generation secret, I’m going to tell you that if you’re in a military-heavy market and you’re not using MilitaryByOwner to list your properties, you are missing out. You’re not just missing out on a great opportunity to market your property, you’re missing out on the opportunity to help a military family find a place to live. And you want to work with military families. Military families are highly organized buyers. You need contracts signed? Consider it done. Yesterday. Military families are not long nurture, waste-your-time leads. When they say that they want to buy a home, they mean they want to buy a home, not shop for homes! They’re on a strict moving timeline. They’re highly qualified buyers. When they’ve got their VA Home Loan approval letter in hand, they’ve been heavily screened for creditworthiness and ability to purchase. You don’t need to fret about financing falling through at the last minute (unless you overpriced your listing...then the VA appraiser is going to have some choice words for you). Most military families will purchase with a VA Home Loan. This is an advantage to you because it means that you’re not chasing down endless repairs and homes with structural problems. Those types of homes simply won’t meet VA standards, so help make that clear to your military clients immediately before you go show those "handyman special" properties. The VA Home Loan generally offers the lowest interest rates around, which means that your military clients often have greater buying power in terms of purchase price than someone shopping with either an FHA or conventional loan product. It's a two-fer! Buy and sell. They’ll move much more quickly than your other buyers. The average American family lives in an owner-occupied residence for 13 years, whereas military families will live in their homes for about four years. When they move, they’ll need to either sell or rent out their home. Make sure you’ve got a property management referral for them if your clients can’t sell in that timeframe. ...and finally, if none of those reasons appeal to you, then maybe the reason that YOU want to work with military families is simply because you want to support the veteran families who serve our country. The best way that you can do this is to help ease their transition into your new community. Did we pique your interest? Good! We love our fellow military families, and we want to make sure that they're in good hands when they're working with a real estate agent. Interested in learning more about your prospective military home buyer clients? Keep your eyes peeled for our upcoming post on how to understand your military homebuyers. Make sure that you're subscribed to our newsletter, or subscribe to the MBO blog in the right sidebar so you can get the post sent directly to your inbox.